In the joy of the risen Lord, I am pleased to welcome you and the delegation accompanying you on this pilgrimage to Rome, which you are fulfilling for the first time as Primate of the Orthodox Church of the Czech Lands and of Slovakia. I am grateful for your visit, which follows that made last year at your Archdiocese by Cardinal Koch, President of the Pontifical Council for Promoting Christian Unity. I thank you also for the fraternal conversation we had and for the kind words that you wanted to address to me. The Apostle Paul, before glorifying the Lord with the offering of life in this city, wrote to the Romans: "Let us look for what leads to peace and to mutual building" (14,19). We bless God for the spiritual bonds that unite us and encourage us to continue in mutual edification and in the common search for peace, a gift of the Risen One. Among these bonds I would like to evoke the presence here in Rome, in the ancient Basilica of San Clemente, of the tomb of Saint Cyril, Apostle of the Slavs, whose preaching has spread the faith in the lands where your Church carries out its mission. At his tomb, Ella celebrated the Divine Liturgy, paying homage to this illustrious saint, revered by the Christians of the East and the West. Precisely the figure of St. Cyril inspires me three brief thoughts that I would like to fraternally share. According to tradition, it was the brothers Cyril and Methodius, coming from Salonika, to bring to Pope Hadrian II the relics of St. Clement, one of the first Bishops of Rome, who died in exile under the emperor Trajan. The gesture of Cyril and Methodius reminds us that we Christians have inherited - and we continually need to share - an immense common patrimony of holiness. Among the many witnesses, countless martyrs have professed fidelity to Jesus in past centuries, such as San Clemente, but also in recent times, for example when atheistic persecution has affected your countries. Even today the sufferings of many brothers and sisters persecuted because of the Gospel are an urgent appeal, which challenges us to seek greater unity. May the example of Cyril and Methodius help us to enhance this patrimony of holiness that already unites us! A second aspect, which reminds us of the Holy Apostles of the Slavs, concerns the relationship between evangelization and culture. Byzantine culture, the holy brothers had the audacity to translate the Gospel message into a language accessible to the Slavic peoples of Greater Moravia. By incarnating the Gospel in a given culture, they gave development to the culture itself. 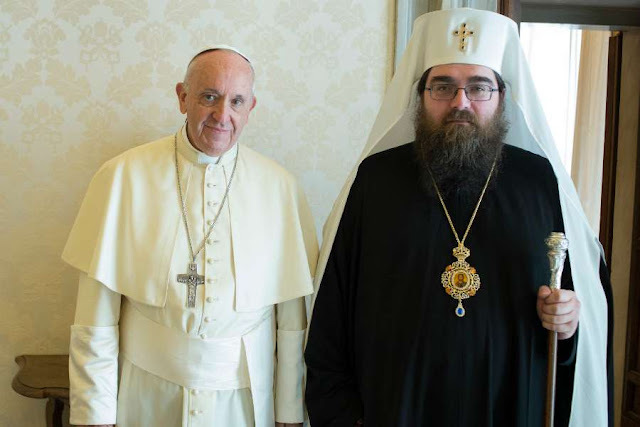 The apostolate of Saints Cyril and Methodius, which Pope John Paul II proclaimed as co-patrons of Europe, remains for all of us today a model of evangelization. To proclaim the Lord is not enough to reaffirm the patterns of the past, but we must listen to the Spirit, who always inspires new and courageous ways to evangelize our contemporaries. It does so today, even in traditionally Christian countries often marked by secularization and indifference. From Saints Cyril and Methodius I would like to take one last idea. They succeeded in overcoming divisions between Christian communities of different cultures and traditions. In this sense we can say that they were "authentic precursors of ecumenism" (John Paul II, Letter Slavorum Apostoli, 14). They remind us so that unity does not mean uniformity, but reconciliation of diversity in the Holy Spirit. May the witness of Saints Cyril and Methodius accompany us on the journey towards full unity, encouraging us to live this diversity in communion and to never be discouraged in our journey, which we are called to do by the Lord's will and with joy. In this regard, I welcome the active participation of your Church in the International Mixed Commission for the theological dialogue between the Catholic Church and the Orthodox Church, through Archbishop Juraj, here present. I hope that this Commission, which has adopted in Chieti in 2016 a document on the relationship between primacy and conciliarity in the first millennium, can continue to deepen the dialogue on this issue. Beatitudes, dear brothers, I thank you again for your visit, a gift to grow in mutual edification, strengthening our spiritual bonds and friendship. I ask the Lord, through the intercession of Saints Cyril and Methodius, that we may one day reach full unity, towards which we walk. I beg you to offer your faithful the assurance of my prayerful remembrance and my cordial greeting in the risen Christ. By invoking upon all the blessing of the Lord and the protection of the Mother of God, I ask you to reserve a place in me in your prayers.